Tunisia's Salafis: 'A Danger' Or Preachers Of God's Law? 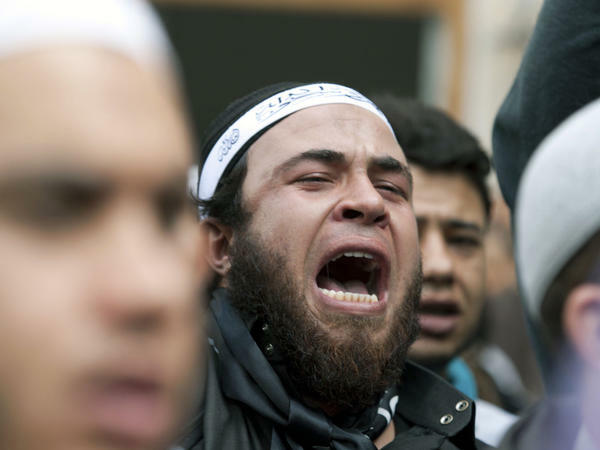 A demonstrator shouts anti-government slogans as he stands in front of the Justice Ministry in the Tunisian capital, Tunis, on Nov. 6, 2012, as part of a demonstration by radical Salafi Muslims protesting against the imprisonment of hundreds of Salafist militants. The uprisings of the Arab Spring unleashed a new political force in the region — Salafis, ultraconservative Muslims who aspire to a society ruled entirely by a rigid form of Islamic law. Their models are the salaf, or ancestors, referring to the earliest Muslims who lived during the lifetime of the Prophet Muhammad. To their critics, the Salafis are religious fanatics who are trying to drag the region back to 7th century Arabia. But the Salafis maintain that they are offering the purest alternative to the dictatorships that have long dominated the region. In Tunisia, where the Arab Spring began, the Salafis pose a troubling question: What do you do with a vocal and sometimes violent minority that refuses to adhere to the democratic process? At a recent protest outside the Justice Ministry in Tunis, hundreds of Salafis condemned the moderate Islamist-led government as oppressors. The rally was called to demand the release of some 900 Salafis arrested for various acts of violence. Two of those detainees have since died in their cells after long hunger strikes. Unlike their counterparts in Egypt, the Salafis in Tunisia reject democracy; they insist that only their rigid interpretation of Islamic law can govern Muslims. Almost all Salafis boycotted the first post-revolutionary elections after Tunisia's dictator was ousted in 2011. This has put Tunisia's moderate Islamist leaders in a difficult position. To the secular elite, the government is too soft on the Salafis, while the Salafis accuse the government of selling out the purest form of Islam. "They are entitled to their rights. As long as they respect the law of the land and they behave as citizens. They don't have the right to impose their lifestyle upon anybody by force," says Said Ferjani, a senior member of the Islamist Ennahda Party that leads the government. The problem with the Salafis, he says, is that they don't recognize the state. "We want to push them, to drag them, into the sphere of politics because they are citizens," he says. But the few who turn to violence must be prosecuted, Ferjani says. "They are a danger," he says. "They are a real danger." The most radical of Salafis, carrying sticks and swords, have attacked cultural events and shrines they consider un-Islamic. They ransacked stores selling alcohol and clashed with the police. Salafi militants are also accused of leading last year's fiery attacks on the U.S. Embassy and the American school in Tunis. Secularists such as Yassine Brahim accuse the Ennahda-led government of not doing enough to stop the violence because of its sympathies with the Salafis. "These people are out of the law. If they are arguing for jihad, for violence it is a big problem," he says. "And Ennahda has a lot of hesitations about how to manage this problem." Brahim is the the secretary general of Al Joumhouri, an umbrella party of secularist groups. He says his party's goal is to preserve the image of Tunisian society as moderate and cosmopolitan. Critics of the Salafis say they are a threat to the revolutionary ideals of economic prosperity, civil liberties and gender equality. Tunisia's highest religious figure, the state-appointed Mufti Othman Batikh, goes even further, calling Salafis uncompromising extremists. "They accuse people of being infidels; they don't accept dialogue," he says in Arabic. "Such stiffness is what made people reject them. This is all a result of their ignorance of the reality and the history of Islam." Egypt's most successful Salafi political party, Nour, has sent emissaries to Tunisia and Libya to try to coax Salafis into politics. A spokesman for the Egyptian party said that is the only way the Salafis will achieve their ultimate goal of implementing Islamic law. But Iskander Boughanmi, a young Salafi cleric in Tunisia, says in Tunisia the Salafis are different. They don't believe democracy is the path to God's law. Boughanmi accuses the Tunisian government and the media of demonizing Salafis, painting all of them as violent militants. Their only crime, he says, is preaching Salafi doctrine. But when we try to spread our message about God's law, he adds, we are stopped and we are persecuted. This is MORNING EDITION from NPR News. I'm Renée Montagne. And I'm Steve Inskeep. Let's continue, this week's look at an ultraconservative religious movement that is jostling for power in the Arab world. When an uprising swept aside the long-time ruler of Tunisia, a religious political party soon took power. Women, for example, might have veils snatched off their heads in the past. That has changed. But the moderate Islamist government faces pressure from the ultraconservatives who want more. They're known as Salafis, people who claim to follow the practices of the earliest Muslims, 1400 years ago. Salafis are considered a minority in Tunisia, but what makes them hard to manage is that they have rejected the democratic process. NPR's Leila Fadel continues our series. LEILA FADEL, BYLINE: At a recent protest outside the justice ministry in Tunis, hundreds of Salafis condemned the Islamist-led government as oppressors. FADEL: The rally was called to demand the release of some 900 Salafis arrested for various acts of violence. Two of those detainees have since died in their cells after long hunger strikes. Unlike their counterparts in Egypt, the Salafis in Tunis reject democracy and insist that only their rigid interpretation of Islamic law can govern Muslims. Almost all Salafis boycotted the first post-revolutionary elections after Tunisia's dictator was ousted. This has put Tunisia's moderate Islamist leaders in a difficult position. To the secular elite, the government is too soft on the Salafis, while the Salafis accuse the government of selling out the purest form of Islam. SAID FERJANI: They are entitled to their rights. As long as they respect the law of the land and they behave as citizens. They don't have the right to impose their lifestyle upon anybody by force. FADEL: That's Said Ferjani, a senior member of the Islamist Ennahda Party that leads the government. The problem with the Salafis, he says, is that they don't recognize the state. FERJANI: We want to push them, to drag them into the sphere of politics. Because they are citizens. FADEL: But the few who turn to violence must be prosecuted, Ferjani says. FERJANI: They are a danger. They are a real danger. SECRETARY GENERAL YASSIN BRAHIM: These people are out of the law. If they are arguing for jihad, for violence it is a big problem. And Ennahda has a lot of hesitations about how to manage this problem. FADEL: Brahim is the secretary general of al Joumhouria, an umbrella party of secularist groups. He says his party's goal is to preserve the image of Tunisian society as moderate and cosmopolitan. Critics of the Salafis say they are a threat to the revolutionary ideals of economic prosperity, civil liberties and gender equality. Tunisia's highest religious figure, the state-appointed Mufti Othman Batikh, goes even further, calling Salafis uncompromising extremists. MUFTI OTHMAN BATIKH: (Through translator) They accuse people of being infidels. They don't accept dialogue. Such stiffness is what made people reject them. This is all a result of their ignorance of the reality and the history of Islam. FADEL: Egypt's most successful Salafi political party, Nour, has sent emissaries to Tunisia and Libya to try to coax Salafis into politics. A spokesman for the Egyptian party said that is the only way the Salafis will achieve their ultimate goal of implementing Islamic law. But Iskander Boughanmi, a young Salafi cleric, says in Tunisia the Salafis are different. They don't believe democracy is the path to god's law. FADEL: Boughanmi accuses the Tunisian government and the media of demonizing Salafis, painting them all as violent militants. Their only crime, he says, is preaching Salafi doctrine. But when we try to spread our message about God's law, he says, they are stopped and they are persecuted. Leila Fadel, NPR News. Transcript provided by NPR, Copyright NPR.